It’s that time of year again! Sleigh bells, mistletoe and LOTS of chocolate! Last week we had our first case of chocolate ingestion – as you can see in the photo, this did not end well for poor Teddy! Chocolate contains a chemical called theobromine which is highly toxic to our pets. High quality, dark chocolate is considered the most dangerous but we strongly advise that you keep all chocolate containing products away from your pets. If your pet does manage to get its paws on some chocolate, you will usually observe symptoms within four hours. Luckily, Teddy’s owner took him to the vet’s as soon as she noticed that he had eaten chocolate. The vet gave him an injection to induce vomiting and Teddy emptied all of his chocolate covered stomach contents! 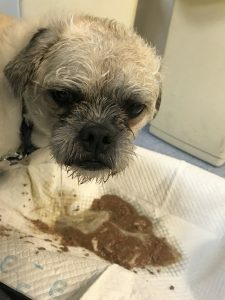 He wasn’t feeling his best but thanks to the fast actions of his owner and the vet department, Teddy has made a full recovery and will not suffer any further complications from the chocolate ingestion. If you think your pet has eaten chocolate, you should contact your vet for advice immediately. The sooner any treatment begins, the less severe the effects will be to your pet. Keep the chocolate packaging to hand so your vet will have an idea of how serious your pet’s poisoning might be.